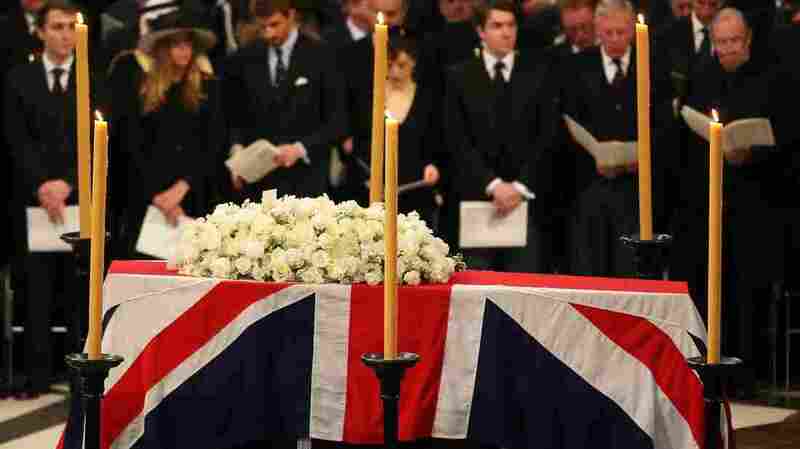 For Thatcher, 'A Great Calm' After A Life Of Controversy : The Two-Way The former British prime minister was remembered Wednesday at a funeral in London. Queen Elizabeth II was among those in attendance. Thatcher died last week. She was 87. Former British Prime Minister Margaret Thatcher's funeral was held Wednesday at London's St. Paul's Cathedral. Margaret Thatcher, the prime minister whose time leading Great Britain in the 1980s brought joy to conservatives and despair to liberals, was remembered Wednesday for "a life lived in the heat of political controversy." With her death last week at the age of 87, "there is great calm" for the Iron Lady, added the bishop of London, the Right Reverend Richard Chartres, during a funeral service at London's St. Paul's Cathedral. Among those in attendance were Queen Elizabeth II, Prince Philip and former Prime Minister Tony Blair. The U.S. delegation included former Secretaries of State Henry Kissinger and George Schultz. As The Associated Press says, Thatcher was laid to rest "with a level of pomp and protest reflecting her status as a commanding, polarizing political figure. ... [Her] coffin was driven from the Houses of Parliament to the church of St. Clement Danes for prayers ahead of the former leader's full funeral at St. Paul's Cathedral. From there the coffin — draped in a Union flag and topped with white roses and a note from her children reading 'Beloved mother, always in our hearts' — was borne on a gun carriage drawn by six black horses of the Royal Horse Artillery to the cathedral, where 2,300 invited mourners awaited." While thousands of supporters lined the procession's route, Reuters writes that "about two dozen opponents of former British Prime Minister Margaret Thatcher turned their backs on her funeral procession and some others booed as her coffin passed through central London." The BBC says "Thatcher's coffin will rest at the Royal Hospital Chelsea, before a private cremation later on Wednesday."